We present a framework that allows for the composition of custom-tailored data structures for hybrid representation of geometry and supports the development of associated geometry processing methods. 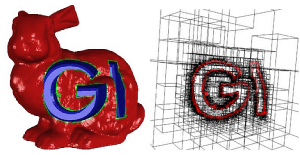 Besides others, a novel hybrid approach for the evaluation of Boolean expressions on polygon meshes is elaborated in this context. By relying on the hybrid geometry information it is – in contrast to previous methods – able to perform such operations robustly as well as accurately.